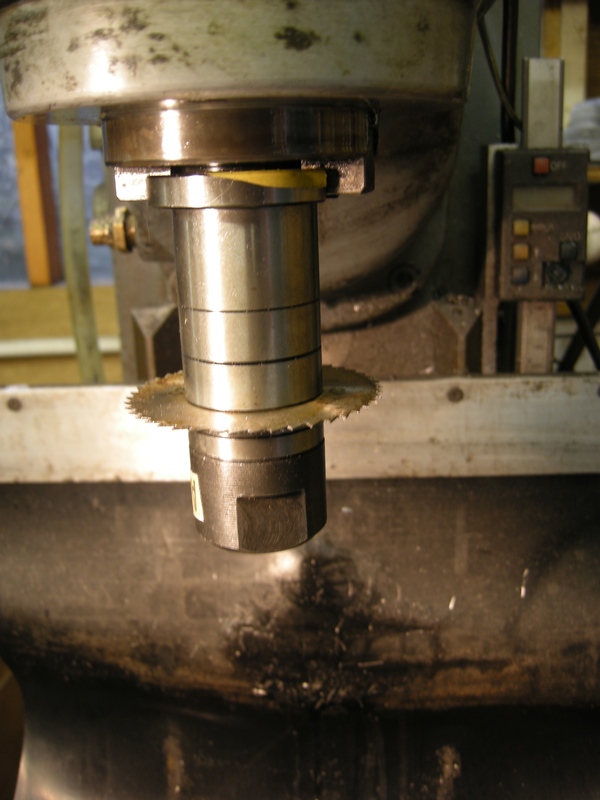 There are cutters that have a taper on them that is designed to fit the taper on the milling machines spindle. These can be considered to be obsolete. All modern milling machines when used in the vertical mode usually have some sort of taper that fits the spindle and holds the cutter or some other tooling that hold the cutter or cutters. Vertical milling cutters can be held by a toolholder that is just a hole in the chuck. The cutter just fits into this hole. The cutter is held in place by a screw that fits a recess on the side of the cutter. This is the side lock chuck. One side lock chuck will only fit cutters of one diameter. It the cutter has a flat on it, it will not rotate. Cutters are made with flats on them for this sort of chuck. They are said to have Weldon shanks or Weldon flats. If the cutter does not have a flat on it, it might rotate. If an endmill does not have a flat on it, it is quite easy to grind a flat on it. A cutter without a flat might rotate but it might also move up or down, even if only slightly. If there is a flat then it only a short length compared to the length of the shank. so long as this is the case it can also be held using a collet. The next possibility for a tool holder is a chuck that uses collets to hold the cutter. This means the one tool holder can be used to hold a range of cutters of different diameters. It is simply the tightness of the collet that stops the tool from slipping either round and round or up and down in the collet. These can be bought to fit almost any type of collet such as the “ER” type. This has the advantage that these collets can also be used for all sorts of workholding jobs other than on the milling machine. Collets like these can be used to hold almost any type of cutter. One common type of collet is the ER series. It is possible to get a special nut for chucks that hold ER type collets. This nut has a ball bearing in it that enables the nut to be tightened more than can be done with the ordinary nut. ER collet chucks can be done up or undone by means of an ordinary spanner, “C” spanners or special spanners. Unlike other collets the procedure when using an ER collet is that the collet is fitted into the nut first then the collet/nut are fitted into the chuck. 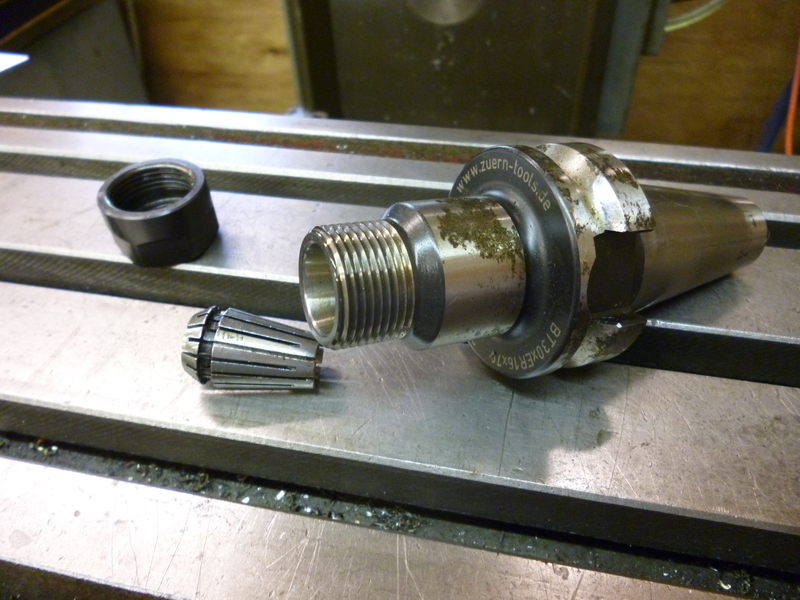 Part of the nut is eccentric so the collet almost clicks in. When the collet is to be removed it comes out with the nut. It then needs a twist to get it out of the nut. An ER collet chuck simply ensures that the cutter being held is concentric with the axis of the spindle. It does nothing to ensure the effective length of the cutter. This is important if the mill is set up for one collet being a certain length. If the cutter has to be removed but replaced later there is no guarantee as to the height of the cutting edge. If the collet and cutter are removed from the chuck there is nothing to fix the length of the cutter sticking out of the collet. One way round this is rather than to change cutter the whole chuck and cutter is replaced with another chuck and cutter. If the first cutter is used again the length of the cutter will be the same as it was before. Alternatively it is possible to make a collar that fits onto the cutter so that it can only be pushed a certain distance into the chuck. 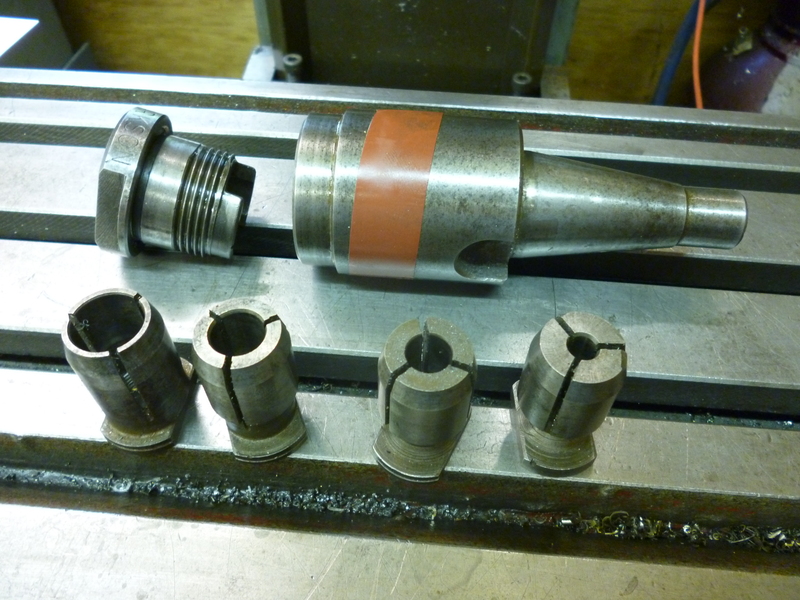 Fig ER collet chuck with cutter and collar – see above. One way of being sure the cutting tool cannot possibly slip is the Clarkson “Autolock” type of chuck. These will be referred to as being “Autolock” chucks though several other makes exist. However the collets from different makes are not interchangeable with each other. 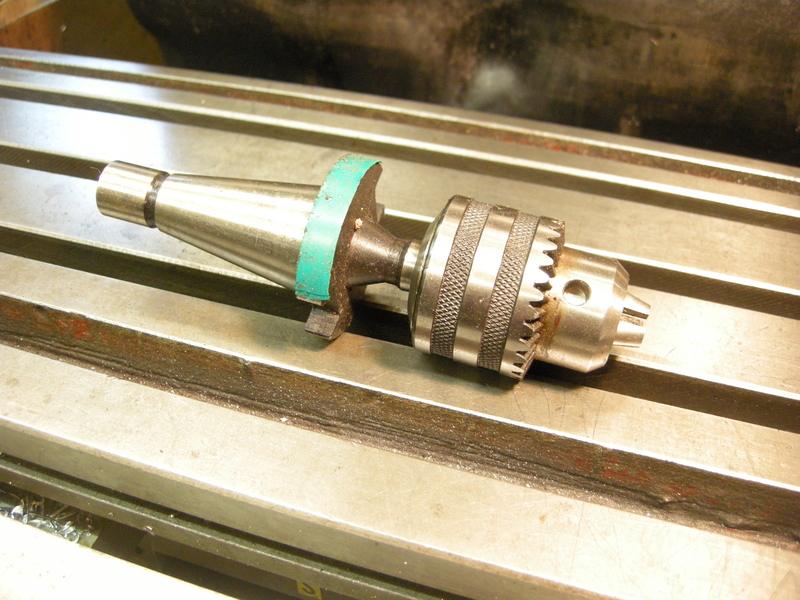 This type of chuck can be mounted onto the spindle using either a Morse taper or an international taper or the special R8 taper used on the Bridgeport vertical mill. The smallest size is normally supplied with four collets, which can be either metric or imperial. The imperial sizes are 1/4, 3/8, 1/2 and 5/8 inches. The metric sizes are 6, 10, 12 and 16mm. The screw thread on all of these sizes, both metric and imperial is 20 turns per inch and of the Whitworth form in every case. It does mean that some sizes like 6mm will screw into a 1/4inch collet but the fit in the collet is not good enough to make this useful. If one of these threads becomes damaged one way of sorting it out is to make a tap for it by grinding an old endmill with the same thread to make a tap for this thread. The cutters that fit the Autolock chuck have a thread on them. This screws into a special nut or in a few cases a collet with a thread in it. . When the collet holding the cutter is tightened up this thread is tightened up and this forces the cutter against a small cone in the bottom of the chuck and tightens the collet around the endmill. The same thing can be bought with either a Morse taper or an R8 taper. The way this works means that for a certain cutter in a certain chuck the effective length of the cutter will be the same even if it is taken out and then put back in again. How this chuck is used is not as one might think. It might seem that with an endmill and the right collet then the bush holding the collet should nearly be screwed up with, say, about one quarter turn left. The endmill is screwed in and then the bush is tightened. This would leave a gap between the bush and the body of the chuck. But this is not the way to do it. The way recommended by Clarkson is, with the chuck loosely assembled, to screw the endmill loosely into the collet. Screw the bush in to hold the collet in. Tighten the bush as far as possible by hand. The shoulder of the bush should now be touching the body of the chuck, if this is not the case it is probably because the cutter is screwed in too far. The cutter is now tightened as far as possible by hand (use a cloth to do this). The special spanner is then used to finally tighten the bush tightly. If this is done the bottom of the rim on the bush is in contact with the top of the body of the chuck. 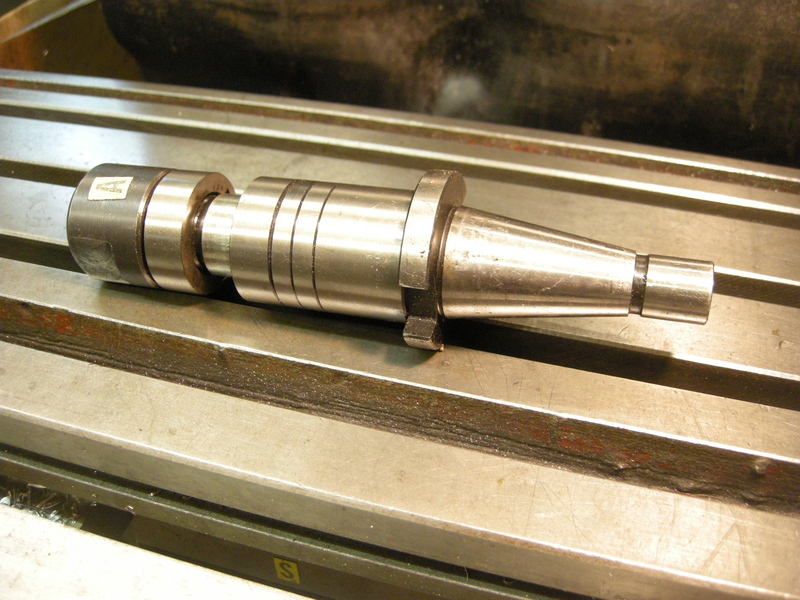 It is important that the female center at the bottom of the endmill engages the male center at the bottom of the chuck. If the male center is damaged it is possible to remove it and replace it with a new one. An Autolock chuck will not work with a cutter that does not have the thread on the shank. Since all solid carbide cutters do not have threads they cannot be held in an Autolock chuck. These have to be held in a side lock chuck or a conventional collet chuck. It is possible to get an adapter that fits an Autolock collet chuck that will hold FC3 type cutters. This adapter holds the cutter like the side lock type chuck. It means that the cutter will fit the autolock chuck even though it does not have the autolock thread. Very often the shorter the chuck and the cutter in it are, the better. This increases the space between the cutter and the milling table. But there are times when it is useful to have a longer chuck to hold a cutter. This could be due to the shape of the workpiece getting in the way and clashing with the vertical head. Chucks are made to enable the user to do this. There are extension pieces that will fit chucks with an international taper. This is an arbor just like that used on a horizontal milling machine as described next. It fits the vertical spindle socket. It is much shorter than the horizontal arbor and is used without supporting the free end. This holds horizontal type cutters but is useable on a vertical head. This enables a vertical machine to do many of the tricks that could normally only be done on a horizontal machine. The nut on the end of the stub arbor is left-handed. Usually when the stub arbor is fitted to the vertical spindle it will do it’s cutting whilst rotating clockwise when looked at from above. This means that any movement of the cutter will tend to undo the nut. In this case it is essential to use a key to prevent the cutter from rotating on the arbor. It is quite common to use more than one cutter on the horizontal arbor and there is no reason why one should not use more than one on a stub arbor. But, of course, the stub arbor is only supported at one end so the load it can take is less. Stub arbor as shown are often about 1 inch or 25 mm in diameter. Where it is necessary hold a slitting saw with a bore smaller than this then one solution is to hold the saw in a small slitting saw arbor as available from the usual suppliers. But this has a plain shank. 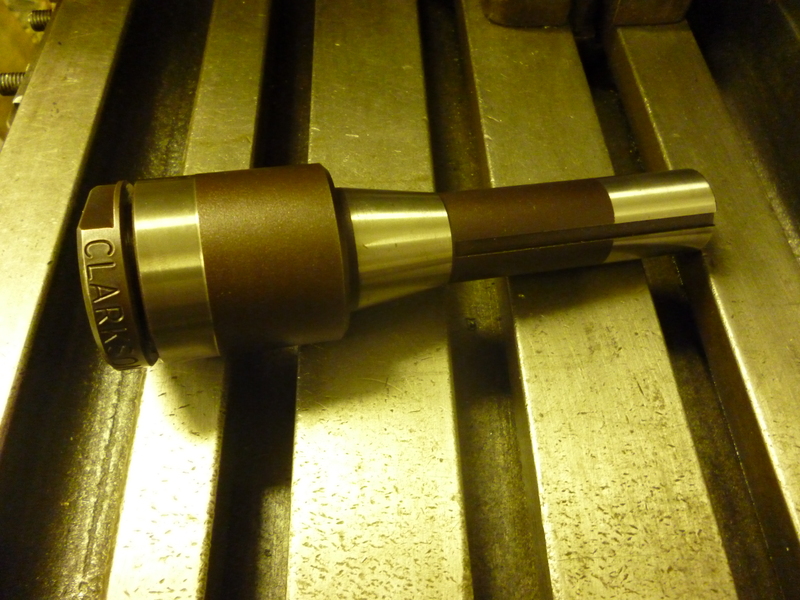 A good way to hold this is in a collet chuck that fits the milling machine spindle. 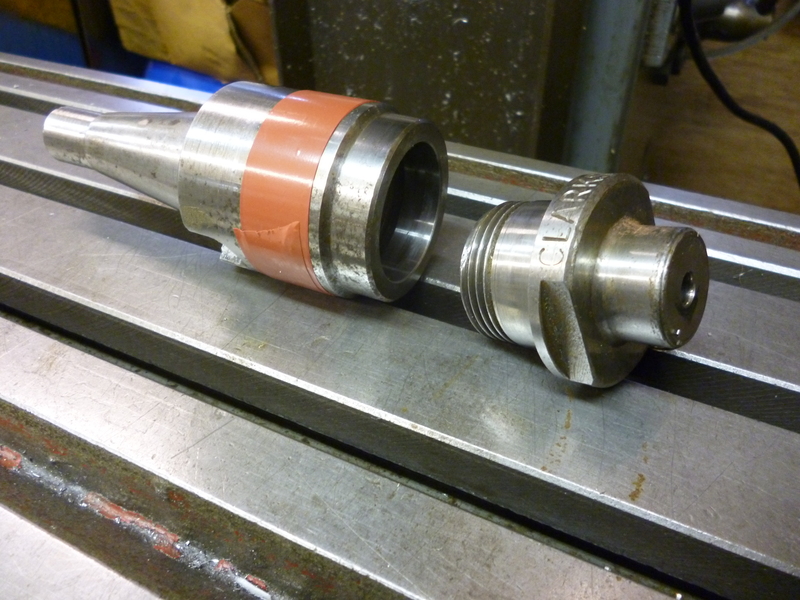 Since the shaft is plain it will not fit in an Autolock type chuck but it will fit in an ER collet. These can be bought complete or they can be made from an arbor which has a taper on it that fits the standard Jacobs taper that is usually found on drill chucks. When using a small milling machine there is often a shortage of space between the workpiece and the cutter, which includes drills. Sometimes the use of stub drills instead of the ordinary length drills can make the difference. 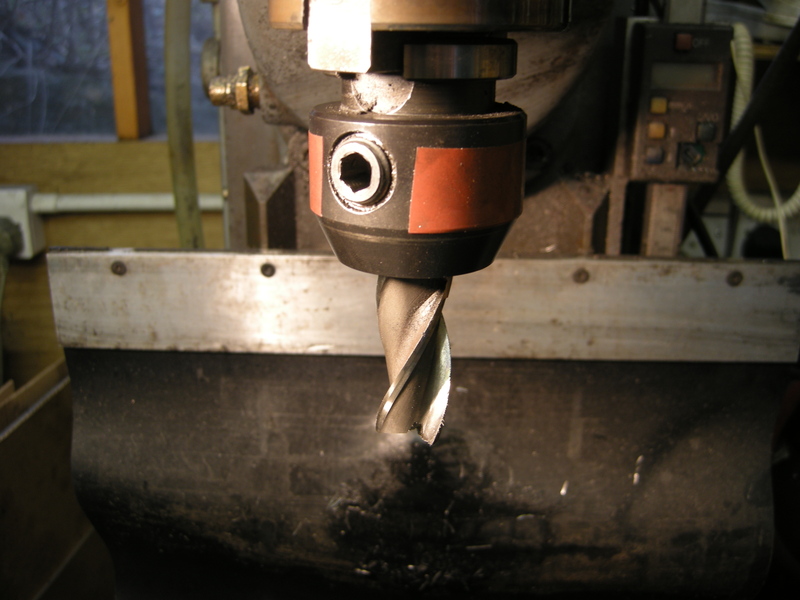 A traditional drill chuck cannot hold a drill as tightly as an ER type collet.